Our existence here on earth is short. Our bodies are very fragile. I just had a front row seat in seeing just how temporary our time on earth is – no matter how strong, how big or young we may think we are. 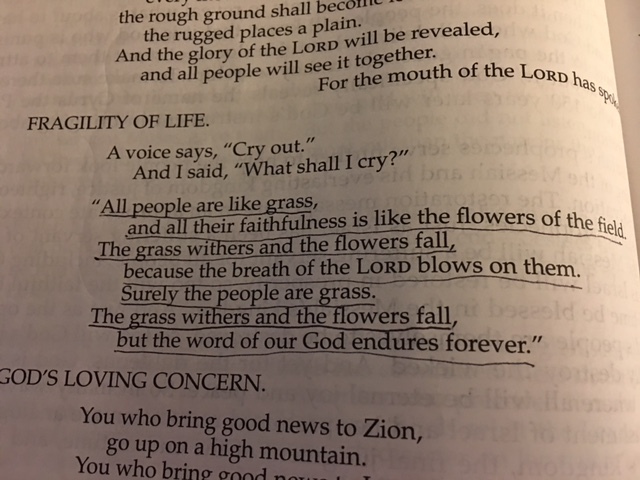 In his 40th chapter, Isaiah compares us to grass that withers and flowers that fall. God is the opposite of us – he is not fragile and he is not temporary. He is strong, he is enduring and he never changes. And he has given each of us a purpose here on earth. What is my purpose? Why am I here? How can I make my fragile life count for something? God knows the answer to all of these questions. We are still here on this earth because our assignments are not completed yet. When our purpose is fulfilled, our light on this planet will go out. Our fragile existence will end and, when we are believers, our eternal existence in heaven begins. Have you figured out God’s purpose for your life here? Are you busy fulfilling your assignment? Open our eyes, Abba Father. Thank you Judy for answering God’s calling and allowing him to use you to inspire us to do the same. I am always blessed by your posts. I really appreciate the encouragement! Thank you!